Last fall I invested in a nice tent, tables and shutters for an outside booth. It is a fun way to show off my wares and I get to meet some really nice folks. I am starting to fill up my calendar with booth events. This Sunday the 21st and Sunday the 28th I will be at the Fremont Sunday Market sharing my booth with Kristen the potter. April 23-24 will be my annual spring show and sale. Invited are Noelle with her photography, Lesley with her watercolor notecards and for the first time - Linda and her pottery. I also hope to have live music by Toni. Details will be finalized in the coming week. May 8th I will have a booth at the Southworth Garden and Art Show at nearby Rodstol Farm.I am looking at a number of other events - so many to choose from! If you know of an event that you like to go to and think it might be a good place for me to have a booth send me some info on it. 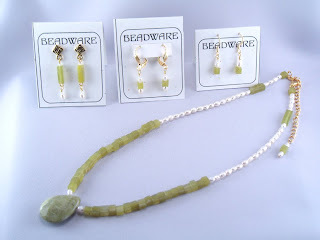 To keep tabs on me you can check here or go to the events tab on Beadware's facebook. fan page. I hope you can stop by my booth sometime. And be sure to send your friends my way! Sssnakeskin jasper is a gemstone of protection and invisibility. It has a range of healing abilities. It guards against negative attitudes and actions, is useful in moving energy and helpful during massage and meditation, and it brings peace of mind. It helps provide a stabilizing energy to our lives and brings productivity and abundance to our minds and bodies. For mystical power, jasper was thought to drive away evil spirits and protect against snake and spider bites. Two weeks since my last post - life has been busy! The birthstones for March are aquamarine and bloodstone, two stones I do not have in my collection. 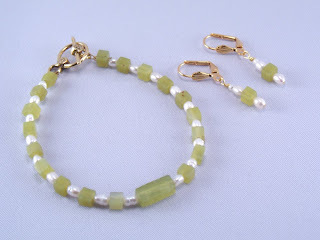 So instead this month I am featuring green - the color of new spring growth. 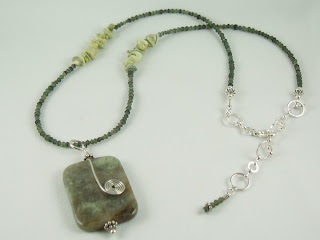 Green jasper brings joy into life. It brings on rain and restores your sense of smell. Good for all the things in your garden and for you during allergy season! Pearls symbolize love, success and happiness. They eliminate emotional imbalance and help one to see themselves, improving your sense of self-worth. Pretty green jasper and pearls.